My Shiny Toy Robots: The Future of Power Rangers? 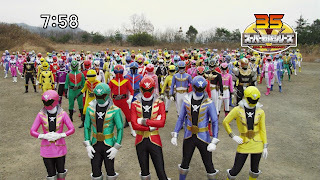 With Power Rangers Samurai currently in its mid-season break, and me currently watching both Tensou Sentai Goseiger and Kaizoku Sentai Gokaiger (the two Super Sentai series that succeed Samurai Sentai Shinkenger, which is what Samurai is based off), I find myself wondering about the future of Power Rangers. Despite its popularity (something I'm very happy about) I've found Power Rangers Samurai to be a somewhat disappointing, and the next two Sentai series may prove difficult to adapt for the US. After all, Goseiger has an angel theme (religion being a touchy/no-go area for US kid's TV) and Gokaiger is an anniversary series that covers 15 years of Sentai that never existed in Power Rangers continuity. Just for fun, I'm going to briefly discuss the areas I think Power Rangers Samurai went wrong (I'll do a more detailed review of the overall series once the series has finished) and then my ideas for how Saban should adapt both Goseiger and Gokaiger. A lot of my ideas are wishful thinking, but I thought throwing a few ideas down on paper might be a good idea. * Americans as part of a Samurai lineage - Power Rangers Samurai so far is pretty much a literal translation of Shinkenger, so the concept of each ranger being part of families where the ranger powers have been passed down for generations has remained. From a story perspective these seems really silly, especially since the beginning clearly states that the Nighloks attacked ancient Japan in the past. I feel the series would have made more sense if the ancient Samurai rangers were Japanese, but following the defeat of the Nighloks the origami animals (which could have also acted as the source of the powers) became the stuff of history - moving around collections, museums for many years. Then, in the present when the Nighloks return, the animals would awaken and choose their partners - which would be the teenage members of whichever families seem to possess them at the time. Cue Master Ji, who's from a lineage of the families that served the original Samurai rangers, who would go on to teach the new rangers the ways of the Samurai. This then would present the problem of introducing the second red ranger (for those who don't want Samurai's big twist spoiled, I won't go into too much detail), but even that could be passed off as the heir to red ranger powers returning to claim them. * Mega Mode suits - I'm going to start off by saying that I love the Mega Mode suits - their nicely designed and help distinguish the series from Shinkenger well. The problem is what their being used for. Why exactly do the rangers need to be armoured when they're piloting giant robots? The Mega Modes would have worked much better as some sort of super mode (think the Legend modes from MagiRanger/Mystic Force), with the Red Ranger also getting a battlizer mode as is PR tradition (and if its anything like the toy, it should hopefully be something very special). This would of course meaning creating more American footage, which brings me on to my next point. * Lack of original ranger footage - So far, the story has stuck horrifically closely to that of Shinkenger. Sure there have been a few differences here and there (Deker's origin being the most noticeable), but otherwise its mostly the same. This is obviously proving cost effective for Saban, who don't need to create any new ranger footage for the fight sequences. Hell, we've hardly had any civilian fight sequences so far. With the money the toyline is apparently making, I'm hoping Saban have something planned for the future of Power Rangers, especially since the final episodes of Samurai seemed to take a noticeable turn from the events of Shinkenger. * The cast - I'm not going into go to great detail here, but Samurai's cast is collectively among the worst in Power Rangers. Until Antonio showed up, they were horrible to watch. Steven Skyler has already proved to be the best actor among the 6 of them, and with Antonio's inclusion the group has picked up (I'm still not fond of Kevin though, and I don't think I'll ever like Emily). I know Power Rangers isn't the most glamorous of jobs, but I find it hard to believe that these were the best people who turned up to casting. Bear in mind I still haven't watched all of Goseiger yet, so I'm basing this on what I've seen so far. Even so, despite it not being a particularly great Sentai series (a full review will be up in the next week or so) I feel it has a lot of potential to be a great Power Rangers series. * Drop the angel theme - This is a given really. However there are plenty of other possibilities for the series. Goseiger has a very majestic aesthetic to it, both in the costumes and weaponry. Therefore I propose something along the lines of mystic/celestial knights. Change the morphing sequence to remove the angel wings, and you're all set. The knights can still be from the three different elemental clans (skick, landick and seaick) like in Goseiger, just change the origin up a bit. Hell, Master Head is already a very Zordan-esque figure - just do something along the lines of Mighty' Morphin, Goseiger looks pretty much like MMPR mkII anyway. * Tone down the card gimmick - It's impossible to get rid of this altogether since the series weighs so heavily on it, but since its pretty unlikely the Dice-O card game is going to make it to the West giving it such exposure seems pointless. * Get rid of Datas - I'm hoping Saban will do this anyway, because he doesn't look like he'd fit in well with a Power Rangers series anyway. How you'd do this when Datas grows, battles and combines with the series Megazord I don't know, but at the very least he'd need some sort of character change. * Make the cast better than Goseiger's - There isn't much else to say here. Goseiger's cast is awful. If Saban followed Goseiger to the bone like they did with Shinkenger, this cast would be worse than Samurai's. This is going to be a very idealised adaptation of Gokaiger. My suggestions rely almost completely on Saban's willingness to film new footage, something I'm hoping they'll do anyway given the lack of it in Samurai (cost cutting for the future?) and just how difficult it'd be to do Gokaiger without it anyway. I'm also well aware my ideas sound like complete fanwank, but then Gokaiger is complete fanwank anyway, and that's brilliant. I don't see why the same can't work for Mighty Morphin' Pirate Rangers (NB. This isn't what I think it should be called). Also, its based on what's happened so far in Gokaiger. Its only just coming up to halfway through, so anything could happen between now and the end of the series. Use the ranger keys less - Now anyone who knows me knows I'm a massive fan of Gokaiger, but one of the few areas it disappoints me in is the lack of fight sequences in Gokaiger mode. The rangers morph, shoot some enemies and then pretty much use the keys straight away. 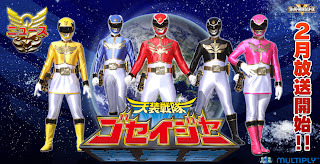 With 16 less ranger teams to use this gives the opportunity for an adaptation to use the Gokaiger suits a lot more. Obviously you can't rule out the pre-Zyuranger teams altogether due to their inclusion in the Sentai War footage - so pass them off as alien ranger teams and give them far less focus. But, at the same time - do it better than Masked Rider did. More variety in guest rangers - Reds are always exciting in Super Sentai, but the can't be said for Power Rangers. Therefore guest spots in an adaptation of Gokaiger shouldn't just be limited to past red rangers. While Cole is the obvious choice for the Wild Force episode, RJ would be a far better choice for a Jungle Fury episode and Cam for a Ninja storm one (As the Hurricaneger episode is still yet to air, for all I know Gokaiger might use Asuka for the episode). The only real problem is tackling Power Rangers RPM, as you have to establish whether that happened in the future or in a parallel universe. But then, there's nothing to say a Gokaiger adaptation couldn't happen after RPM and the fall of Ventrix. A new GokaiSilver origin - I haven't really given this one much thought yet as Gai is still relatively new to the series, but I can't see a Power Rangers fanboy really working as a character. Especially when you consider the ghost rangers that gave him his powers (Dragon Ranger, Time Fire and AbareKiller) didn't die in their respective Power Rangers series. I always thought some sort of Zangyack bounty hunter would work as an introduction. The GouJyuDrill would work fine as a spaceship, and Silver could be working alone to get the powers until he meets up with the rest of the rangers. As I said I haven't put that much thought into this (I literally came up with that explanation as I typed it) but I don't see why that couldn't work. So yes, these are some of the thoughts I had on how the future of Power Rangers should be shaped. It was very much a 'for fun' post that I came up with while bored, and shouldn't be taken too seriously. I very much doubt anyone working for Saban will ever read this, but on the off chance you are - feel free to steal my ideas. If it makes future programming more like the glory days of Power Rangers, then I'm all for it. For companies the use of social media can bring many benefits when talks about the repurchase of the Power Rangers franchise from Walt.